Black America's Footprint: Why are Federally (and state) Funded Black History Museums Failing Nationwide? Mortality is a tough pill for most people to swallow; for others, the realization that we will one day die is a reality easily digested. But we will all leave behind a legacy. Good or bad, we will be remembered. 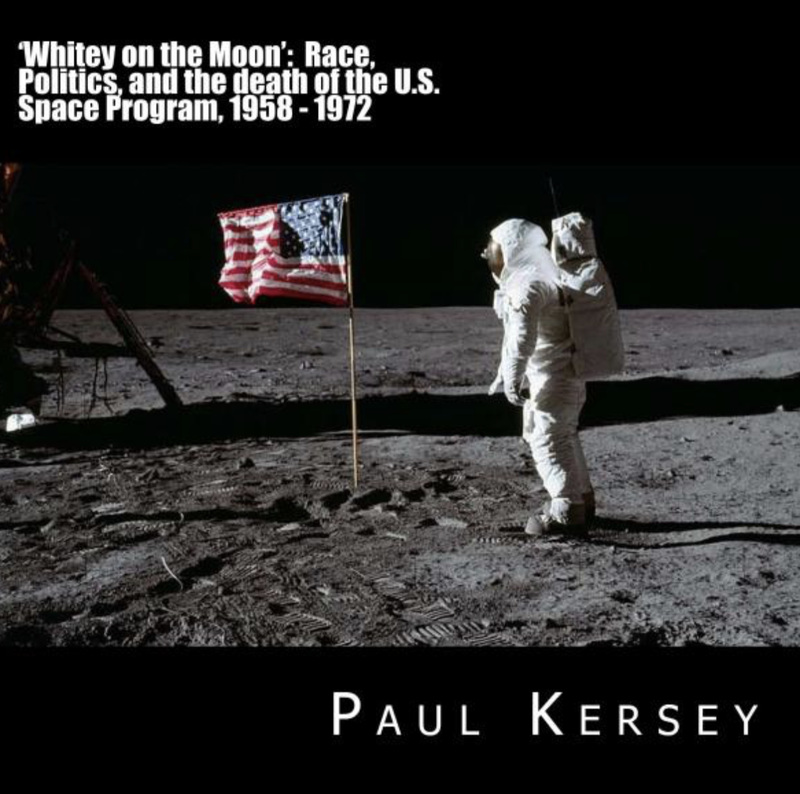 If every human alive today suddenly became infertile, with scientists unable to reproduce a test-tube baby, it’s important – vitally important – to remember the contribution of America in the post-civil rights era. For long after the last human died, all the great museums built across America in the past thirty years would tell a fascinating story about the struggle fought in the twilight of mankind’s existence. Take for instance the $110 million National Underground Museum Freedom Center. Finished in 2004, this museum celebrates the loose confederation of individuals who helped slaves escape north. It opened to great fanfare and promise in 2004. Now, the National Underground Railroad Freedom Center, whose exhibits focus on the story of the American struggle for freedom, especially that of African Americans, is in deep financial trouble that could force it to shut down. Located where African Americans crossed the Ohio River into freedom, the center has cut expenses severely but faces a $1.5 million shortfall in its 2012 budget, said Freedom Center board Co-chairman John Pepper and other center leaders. Same with Baltimore’s Reginald F. Lewis Museum of Maryland African American History & Culture; projected to garner more than 150,000 visitors a year when it was built (largely with public funds), it has consistently failed to attract more than 38,000 a year and failed to generate $2 million in revenue (the state government annually matches this amount, meaning shortfalls must be picked up by the taxpayers of Maryland). Built for $38 million in the 1990s, the over-the-top black supremacist museum in Detroit, The Charles Wright Museum of African American History can no longer be supported by the taxpayers of the 83 percent black city. The combined black power of more than 550,000 black taxpayers helped turn the lights out on Detroit being a viable city, with the largest municipal bankruptcy in US history happening almost 40 years to the date Coleman Young became the first black mayor of the city. Now imagine one more: Detroit bankruptcy shutters nation’s largest African-American history museum. No entity is immune from the city’s bankruptcy. But we ought to save the Charles H. Wright Museum to avoid the embarrassment. And by we, I don’t mean just the city. Detroit owns the Wright, the nation’s largest institution committed to preserving and teaching the public about the African-American experience, according to its mission. Under its contract with the museum, which expires in 2019, Detroit is to provide a significant amount of the museum’s operating expenses. That support dropped from 48% in 2010 to 21% this year. The board, which met last week, made publicly clear that the museum is not sustainable without city funding. Walt Douglas, chairman of Avis Ford and a museum board member, said in a letter to Mayor Mike Duggan that in a city with more than 550,000 African Americans, the Wright “should not be forgotten or overlooked” during bankruptcy negotiations and subsequent budget battles. Funny: every folly Detroit has endured that Rochelle Riley laments has been while black citizens have been in control of city hall and held a black vise on the public sector (cronyism in jobs to connected members of the black community, no-bid contracts to the right minority-owned firms…). The Charles Wright African American Museum is an extraneous, superfluous building; the condition of Detroit in 2014 is ultimate testament to black history in America. 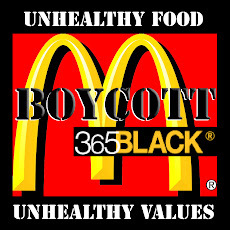 Just as people choose to stay away from Detroit, they also decline a visit to the black history museum found there. From sea-to-shining-sea, federally (state) financed black history museums fail to attract an audience and rarely stay solvent. America is much more than black history; indeed, the contributions of black Americans could realistically fit on the back of a baseball card. A card you couldn’t trade away even for a piece of chewed gum that had lost its flavor. No matter what you do in life, you can’t prolong a meeting with the reaper. It’s what you do in life that defines you. Strangely, the collective individual lives of black Americans (when housed in a million-dollar building) fail to inspire a crowd… a ready audience spoon-fed white guilt from the moment their old enough to have a cogent thought. Black America’s footprint is Detroit: once known as the “Paris of the West,” today it’s a city filled with decaying, blighted reminders that a civilization once flourished there. Regardless of their academic qualifications (they could always enroll at the University of North Carolina and only take African-American studies courses...), it looks like a roster for a Southeastern Conference - SEC - football/basketball team. It's none of these though. 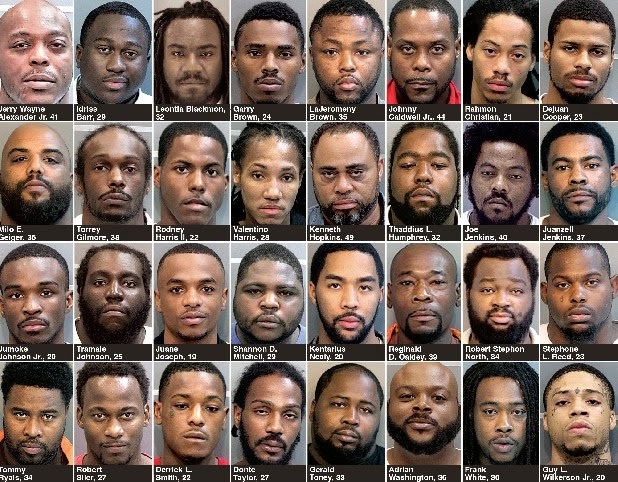 Just like the "Worst of the Worst" criminals in Chattanooga, Tennessee, the Cincinnati Police Department rounded up the most dangerous criminals in Hamilton County. And every one of them were black. A four month investigation by local and federal authorities has led to the arrest of some of the most dangerous criminals in Hamilton County, according to the Cincinnati Police Department. Authorities focused on a specific gang ring operating in the West End neighborhood and Thursday morning took 15-18 people into custody. Cincinnati Police say the investigation began with the arrest of murder suspect Julius White back in October. He's accused of killing Dwayne Lamarr Lewis Jr., who's body was found in the middle of the street near the intersection of Blaine Road and Knox Street in South Fairmount. After his arrest, authorities discovered White controlled the drug market in the West End. Now White and several of his associates are behind bars. "I saw all these police and people with black on. They were busy trying to get in the door but I guess that boom helped them to get that door because all of them people went in that door," says West End resident Shirley Colbert. Colbert says she woke up to the sound of police breaking off a neighbor's door. Cincinnati Police had made their move early Thursday morning making several drug and violent crime arrests in the neighborhood of West End. Assistant Cincinnati Police Chief Lt. Colonel James L. Whalen says in all 18 men all connected to White were involved in drug trafficking, illegal firearms possession and violent acts. Thursday, they took 11 illegal weapons off the streets. "We are going to do what we need to do to end violent crime in the city," said Mayor John Cranley at a press conference acknowledging the department's efforts. His arguments could have been lifted directly from [FOP President Elmer] Dunaway more than 20 years earlier: Yes, black men are getting shot for resisting arrest and assaulting cops – but what about all the cops who have been killed by black men in Cincinnati? What about the crime? During the riots, Fangman was deplored like Dunaway for pointing out that 90 percent of the violent crime, 95 percent of assaults on cops, 93 percent of murders and 90 percent of rapes were committed by less than 40 percent of the city population – black males. That upset Cincinnati’s business and political leaders. The weapon of choice has changed from fists to bullets in Cincinnati. By far, the handgun was the weapon of choice in the city’s 75 homicides in 2013. Sixty-one victims (81.3 percent) where shot to death. It’s troubling to Police Chief Jeffrey Blackwell, who is nearing his first 100 days at the helm of a department grappling with a 42 percent increase in homicides compared to 2012. Blackwell, who was hired on a platform of community engagement, believes this year’s new engagement strategies will curb homicide in 2014. Cincinnati ended 2013 drenched in fear that, in many parts of the city, no one is safe from gunfire. Blackwell said citizens can expect a reduction in violent crime and homicides in 2014 in part because of a wide variety of initiatives to engage teens and the community at large. “It’s never going to full go away (violence), but we certainly are going to have an impact here. I guarantee you,” Blackwell promised. But it could go away. White people aren't committing crime in Cincinnati. CINCINNATI – From reducing the city's homicides to stretching the department’s staffing and improving the quality of service, Cincinnati Police Chief Jeffrey Blackwell and other department leaders on Monday outlined strategies to combat homicide and violent crime. Seventy-five people were slain in Cincinnati in 2013 - a 42 percent jump from 2012, giving it the distinction of having the highest rate of homicide when compared to similar sized cities in the region. During a nearly two-hour public session at the Cincinnati City Countil meeting Monday, Blackwell at times faced tough questioning, including how police can get tougher on crime, or as Councilmember Christopher Smitherman suggested, adopting a “zero-tolerance” policy. Many in the police department, though, believe zero-tolerance policing is an archaic tactic that does more harm than good. “We want to be aggressive, but we also want to be right,” Blackwell told members of the law and public safety committee. “We don’t want to be aggressive for the sake of aggression and violate people’s constitutional rights, while we try to get it right. We’re not going to go back to those days where we get somewhat reckless in our approach. 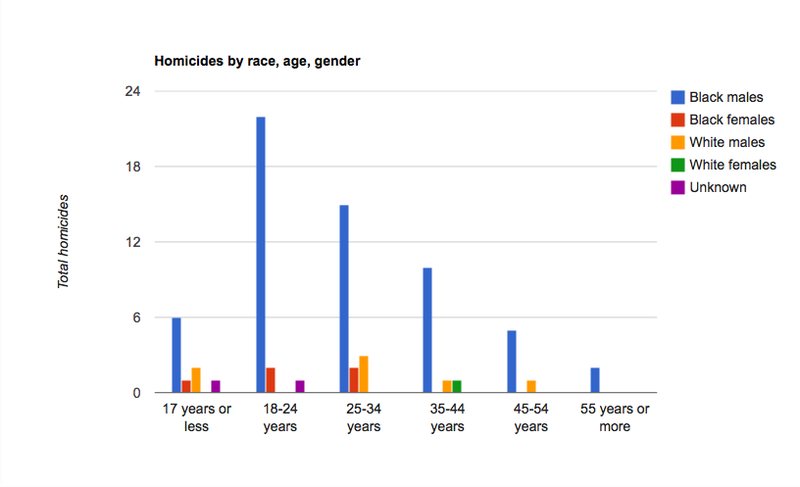 Of the city's 75 homicide victims, 58 were black men. Of the 41 closed cases, 34 black men were arrested in connection with a homicide. While Smitherman and Councilmember Charlie Winburn recognized the black-on-black violence trend Monday, both wanted to hear solutions from Blackwell. Most communities in the country are facing pervasive black-on-black crime, Blackwell told the committee. The level of black-on-black crime in not just Cincinnati, but all of America is unacceptable. But it's not going to change anytime soon. CINCINNATI —Cincinnati's homicide rate dropped a bit in 2011, but not by much. And a little more than half of the homicides reported last year remain unsolved. There were 69 homicides reported in Cincinnati in 2011, down from 73 a year prior.Of the 69 homicides, arrests had been made in only 31 of the cases. In three cases, the victim died from police gunfire. Avondale and Over-the-Rhine were the areas with the most homicides, 11 each. In what continues to be a disturbing trend in Cincinnati, the vast majority of homicides are cases of black-on-black crime. All but two homicide victims and one suspect were black. Forty-three percent of Cincinnati's 331,000 residents are African-American. But 80 percent of murders in the city since 1995 - 188 of 238 homicides - involved black victims and black offenders, according to law enforcement statistics. The phenomenon of black-on-black crime increases each year, locally and nationwide, according to police and FBI crime reports. But getting black people to strive to attain (and perpetuate) the standards governing civil behavior - as established by whites - isn't a priority in Cincinnati or America. Just like the all-black police association in Baltimore, the Vanguard Justice Society, Cincinnati has a black police association too: the Sentinel Police Association. The point of all of this is simple: crime has a color in Cincinnati. It's another reminder race is real, with the only social construct in America being that of equality. It was something Miss Alice J. Reilley wrote in 1917, in a letter addressed to the mayor of Baltimore. Black Baltimoreans seized the opportunity to renew their movement into white neighborhoods. Two black families moved into the 1100 block of Bolton Street, one of the oldest middle-class residential sections of the city; another family moved into the 1200 block of McCulloh Street.' White Baltimoreans responded with petulance and frustration. Miss Alice J. Reilley asked, "What is the use of trying to beautify a city or put in any civic improvements if Negroes are to acquire all of the property?" A haunting query from 1917 (penned when the city had a population of 558,000 and was 85 percent white), one that, the longer it goes unanswered, proves its eternal truth: "What is the use of trying to beautify a city or put in any civic improvements if Negroes are to acquire all of the property?" BALTIMORE — Shivihah Smith’s East Baltimore neighborhood, where he lives with his mother and grandmother, is disappearing. The block one over is gone. A dozen rowhouses on an adjacent block were removed one afternoon last year. And on the corner a few weeks ago, a pair of houses that were damaged by fire collapsed. The city bulldozed those and two others, leaving scavengers to pick through the debris for bits of metal and copper wire. For the Smiths, the bulldozing of city blocks is a source of anguish. But for Baltimore, as for a number of American cities in the Northeast and Midwest that have lost big chunks of their population, it is increasingly regarded as a path to salvation. The result of this shrinkage, also called “ungrowth” and “right sizing,” has been compressed tax bases, increased crime and unemployment, tight municipal budgets and abandoned neighborhoods. The question is what to do with the urban ghost towns unlikely to be repopulated because of continued suburbanization and deindustrialization. Just shy of 100 years to the date Miss. Reilley’s letter arrived to the mayor Baltimore, attempts to beautify the city and engage in civic improvements literally mean tearing down the white past to accommodate the black, bleak future. Those “city blocks” – filled with once beautiful, now inhospitable rowhouses - Shivihah Smith laments being torn down in 2013 were built by a people far different than the one that oversaw their ruin. But in their removal, Miss. Reilley’s question finally receives an answer. Democracy only applies to using the law to screw over white people on behalf of blacks (and increasingly all non-whites). Spike Lee understands this fact, why can’t you Trader Joe’s/Whole Foods shopping, Apple product buying, granola chewing, Crossfit participating, white-bread motherfuc*kers understand that fact? Baltimore once had a culture, cultivated by a people represented by Miss. Reilley (a culture swiftly terminated when Shivihah Smith’s took over), whose 1917 letter presents a question no modern-day advocate of equality can dare answer. Today, its culture is a byproduct of the majority population: and the plexiglas protecting employees (and the entire contents of convenience/liquor stores) from this population is a powerful statement addressing Miss. Reilley’s 1917 question. 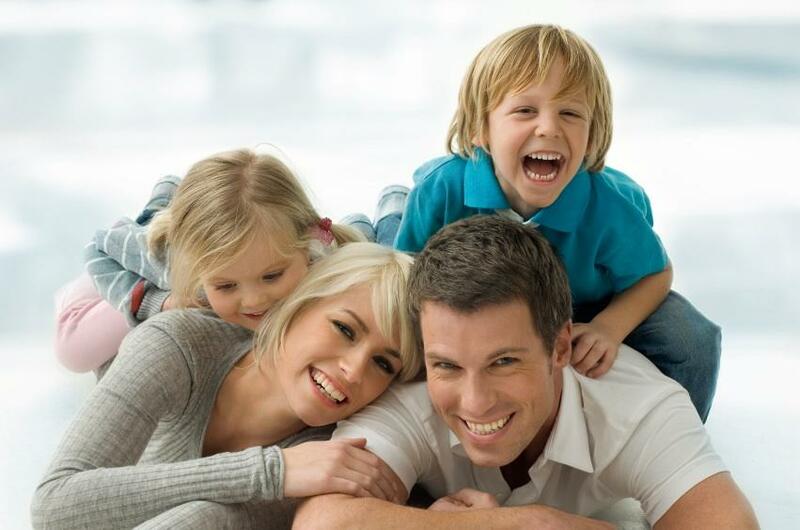 The ability for a community to see wealth creation, an increase of property value, the maintaining of a tax-base, and the integrity of a business district is reliant on social capital flourishing. Which was the underlying thesis of Miss. Reilley’s 1917 letter to the mayor of Baltimore. Wherever the white Diaspora of Baltimore fled to [Rating the 'Burbs: Schools, safety, parks, pools, taxes, population, hospitals, incomes, home values, and much more!, Baltimore Magazine, May 2003], prosperity followed; what was left behind in Baltimore was the breeding/proliferation of the exact type conditions Spike Lee praises as the culture of his people being uprooted by gentrification. What was it Miss Reilley wrote back in 1917? Oh: "What is the use of trying to beautify a city or put in any civic improvements if Negroes are to acquire all of the property?" So almost 100 years to the date of Miss Reilley’s letter to the mayor of Baltimore, current citizens of the United States have a lot of empirical evidence that helps conclude her fears were 100 percent correct. Just as bad money drives away good money, bad citizens drive away good citizens. It’s not a crazy question to ask: What would property values be like in Baltimore was the city 85 percent white today (as it was around 1917, when Miss Reilley wrote her letter)? It’s not a crazy question to ask: What would the jails of Baltimore (housing the people who helped turn the city into, as David Kennedy described, “hell”) look like was the city 85 percent white today? With an average daily jail population of 4,010 (in 2008), Baltimore City (Baltimore is not a county, but considered a city of Maryland) has the highest percentage of its population incarcerated for the top 20 largest jails in the United States. With .629% of the jurisdiction in jail (Shelby County, TN -home of Memphis - and Philadelphia City, PA close seconds), the astounding cost of policing the 63 percent black city should be obvious. A network of surveillance cameras throughout the city (initially costing $10 million to install and $1.4 million per year to operate) works as a 24/7/365 deterrent to crime. Now who might be committing that crime? Nine of the 10 people in the jails are black. 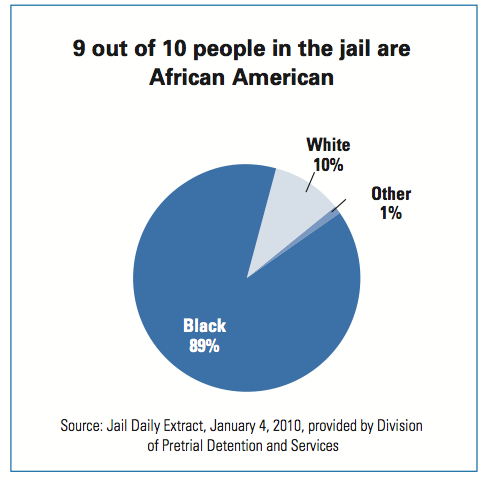 African Americans make up the largest percentage of the people in the jail. Despite making up only 64 percent of Baltimore residents, African Americans comprise 89 percent of the people held in the jail; currently more than 2,900 African American men are incarcerated in the jail. The reasons for the high number of African Americans in the jail are numerous, but studies show that it is not related to actual behavior differences. In cities and states around the country reasons for the disproportionate number of African Americans in jail can include policing practices and enforcement in certain communities, disproportionate allocation of resources, disparate treatment by the courts and lack of quality defense, amongst other reasons. The responsibility for alleviating these disparities falls not only on criminal justice agencies, but on society as a whole, and needs to be addressed appropriately through both policy and practice at all levels of government and the community. Actually, it is behavioral differences between the races that account for the high number of blacks in jail (in not just Baltimore, but all across America). The outcome of these behavioral differences being played out in a community is what drove Miss Reilley to write her letter to the mayor of Baltimore in 1917, asking: "What is the use of trying to beautify a city or put in any civic improvements if Negroes are to acquire all of the property?" 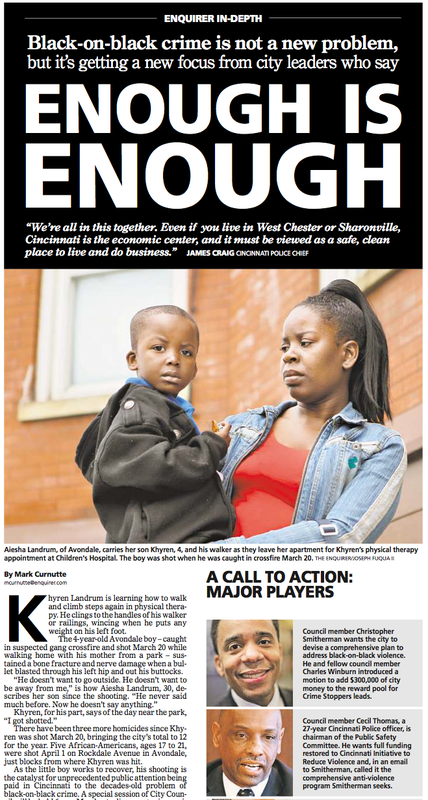 As a mother of nine, Jean Yahudah worries about whether her children are safe in her Park Heights neighborhood. She has had windows shot out of her Woodland Avenue home, bullets fired through her van, and every one of her children, ages 8 to 31, knows a friend or acquaintance who was shot or murdered during the past few years. "There's just too much violence," she said. "I want to live in a normal, safe and healthy neighborhood." Yahudah offered her home yesterday as a gathering point for volunteers, who picked up fliers and spread the word that gun violence will no longer be tolerated in Park Heights in Northwest Baltimore. Yahudah was also one of dozens of people who went yesterday to Agape Fellowship Miracle Church for a service aimed at winning support for a crackdown on gun violence called Operation Safe Neighborhoods. The service was at Langston Hughes Elementary School in the 5000 block of Reisterstown Road. The effort occurred two weeks after state and federal law enforcement officials took 27 convicted felons from Park Heights into the Baltimore City state's attorney's office to warn them that prosecutors and police are intensifying their focus on gun violence in the community. State and federal officials chose Park Heights for the initiative because of recent gun violence, she said. In 1999, 13 homicides and 36 nonfatal shootings occurred in the area and 49 firearms were seized by police, according to statistics compiled by Operation Safe Neighborhoods. "This is unprecedented in that we never warn people that we're watching them and go after them if they use guns," said Kimberly Bowen Morton, a prosecutor and gun violence coordinator for the Baltimore City state's attorney's office. You can’t live in a normal, safe, and healthy neighborhood, because such a community requires a different racial group to create the conditions necessary for such an outcome. It all boils down to Miss Alice J. Reilley’s 1917 letter (fearing the negative effects of a majority black community), juxtaposed with Spike Lee’s rant against gentrification (lamenting the positive effects of a majority white community). "What is the use of trying to beautify a city or put in any civic improvements if Negroes are to acquire all of the property?" It is the official policy of the United States of America to turn every neighborhood, community, city, and state into nothing more than a Baltimore. Alice J. Reilley, writing back in 1917, knew how it would all turn out, just as Spike Lee knows how gentrification of “blighted” black communities turns out. If she could be resurrected today and see the state of her beloved city, well, she’d smile. Her letter from 1917 prophesized why private Baltimore business owners would one day need to install Plexiglas to protect their employees and products; and Spike Lee celebrates the very conditions that Reilley correctly attributed as a byproduct of blacks (their culture). "VIBE" Magazine asks: Why Does America Fear a Black Planet? Has Vibe not seen Detroit (remember, it's nothing more than a "microcosm of black America")? The condition of the 83 percent black city (under complete and total black political control since 1974), unless you're Sen. Rand Paul, should put the fear of God into any sane, rational individual. So, why should America fear a black planet? If you don’t have a sense of humor or can’t laugh at the absurdity of life in the waning moments of the “American Century,” then descend into an endless of bottle of your favorite inebriant. David Woods, the victim of a hammer attack (by a black man with a laundry list of priors) in black-run Philadelphia... another story you've never heard about. Just remember this one, simple, indisputable fact (before you go all Nicholas Cage from Leaving Las Vegas): it takes an endless barrage of propaganda – never ceasing, perpetually unrelenting – to maintain the degenerate course the United States of America has taken since the war on Freedom of Association became a rout. 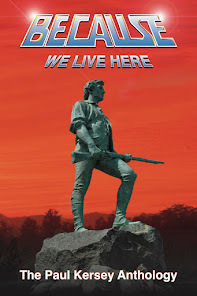 Freedom of the Association means the right to discriminate, and when the entire modus operandi of the Federal Government is to openly discriminate against white people (confiscating individual wealth to subsidize and uplift non-whites as well), well; it should be fairly obvious where this is all headed. With but one day from the two-year anniversary of the fatal encounter between the white-Hispanic George Zimmerman and the cherub-faced, eternally sweet and innocent Trayvon Martin, it’s worth reminding ourselves of the lesson from this event: when in doubt, always blame white people. It’s the most obvious conclusion from the Zimmerman/Martin affair. What, do you need someone to beat it over your head? How about with a hammer? A suspect has been identified in the brutal hammer attack on a Gloucester City man in Philadelphia last week. 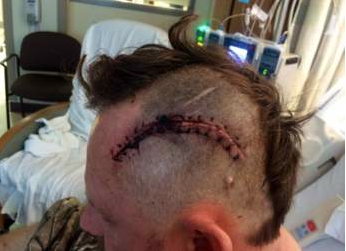 David Woods Sr., 46, sustained a head wound that left a scar across the side of his skull. He also has lost the ability to speak but is expected to make a full recovery, police said. Police have identified the suspect as 29-year-old Nathanial Maybin of Philadelphia. He remained at large Monday night. The assault reportedly happened around 5 p.m. Thursday outside a deli near 49th Street and Lancaster Avenue in West Philadelphia. In surveillance footage from the assault, an attacker rains down blows to Woods’ head with the claw hammer. One of Woods’ employees eventually broke up the melee and drove his boss to a nearby hospital, officials said. “The victim has a large laceration on his head that was stitched closed during surgery to release pressure on the brain,” Philadelphia police reported in a news release. His first words, when he regains the ability to speak, will hopefully be an admission of his eternal white guilt. Every failure of blacks in Philadelphia, particularly their inability to sign up for Obamacare (right Philly Mayor Michael Nutter? ), is the fault of white people. Nathanial Maybin is nothing more than a foot soldier in an – as of yet unnamed – army, merely doling out punishment for centuries of abuse and subsequent unearned white privilege David Woods enjoyed. Justice for Sundown towns, separate water fountains, and especially for... insert your excuse for failure here. David Woods story isn’t fit for print or dissemination by a media obsessed with finding the next George Zimmerman/Michael Dunn to screw like some uncooked piece of white (for the former, white-Hispanic) meat. He is the son-in-law of Bill Cleary, the editor of CNBnews.net in Gloucester City, who was frustrated by an initial absence of public information and news coverage. Had Mr. Woods been the aggressor in this assault, the hammer would have become a holy relic in the Civil Rights Movement, a valuable addition to any black-themed museum (much as the hoodie Mr. Martin wore the night he was murdered in cold blood by the frothing-at-the-mouth bigot Zimmerman has become). But for now, remember the hammer has only target: the white man’s head. You know what? It doesn’t even need to be a hammer. How about a brick, like the one used in the maiming of Baltimore Sun sports editor John Fogg last month? Baltimore City Police Commissioner Anthony Batts announced Friday afternoon that officers arrested Mustafa Eraibi, 19, in connection with the beating and robbery of a man walking in Canton last week. Eraibi is charged with attempted murder, armed robbery and gun violations. Jon Fogg, an editor for The Baltimore Sun, was walking in the 3400 block of Foster Avenue in Canton around 2 a.m. Jan. 14 when he was attacked. Charging documents indicate Eraibi approached the victim on bike, beat him with a brick on the head and took off with the victim's car and laptop. Police traced the victim's credit card and found surveillance photos of the suspect from places where it had been used. One of the three stores where police said Eraibi used Fogg's credit card was the 7-Eleven on West Baltimore Street downtown, where police said Eraibi was caught on video. Fogg suffered severe injuries, including skull fractures and broken bones and teeth. "He has six skull fractures. He's missing about eight to 10 teeth that were knocked out. He has fractures in his hands," said Fogg's sister, Melissa Castone. Castone said the focus is primarily on her brother's recovery. After the attack, she set up a page on the Go Fund Me website, and in four days, more than 600 people donated nearly $24,000. Eraibi was charged with robbery and assault in at least two previous cases but he was not prosecuted. When 11 News asked about this, the Baltimore City State's Attorney's Office did not provide an explanation. Among the pictures on Eraibi's Facebook page is one of a masked person holding two guns. Charged with two previous cases of assault, but no charges filed? Allowed back on the streets? What do you expect in a city completely dominated by black political control? Eraibi is nothing more than a foot soldier in an army. Just two white men, attacked in obviously isolated incidents. Two more names added to a list of tens of thousands (if not hundreds of thousands or a few million) of white people whose privilege was to be nothing more than a object for exacting black justice upon.